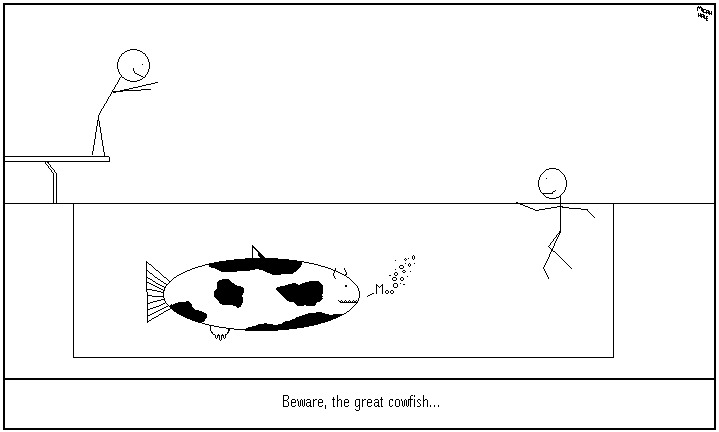 None of the other land-cows have udders, but the fishy-cow does. Hm. I don't know why, but I guess the fish just needed one. Land-cows don't need them. Well maybe the milk cow does on that last page. I don't know why or how this cowfish got into these kids' pool, but he is in there, and is going to munch on the poor little stick kids. They will be okay, though. They are in the next picture.